BOCA RATON, FL — Boca Raton Football Club returns for its second season in the National Premier Soccer League with a full slate of game during the 2018 Sunshine Conference that will give fans even more games to watch their local soccer team. 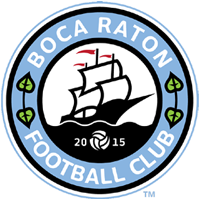 Boca Raton FC will play a total of 12 games, six home and six away, and will begin the 2018 season at home on May 5 at 6 pm versus Miami United FC. During the offseason, the NPSL Sunshine Conference got much tougher with the addition of Miami FC 2 and Jacksonville Armada announcing they will field their NASL team in the sunshine conference. Boca Raton FC will see both these teams right away as the club will travel to Jacksonville on May 13, and then will head down to Miami FC 2 on May 16. Boca Raton FC returns home on May 19 as they take on Naples United before going on the road again to Central Broward Regional Park as they take on Fort Lauderdale Storm on May 26. In June, Boca Raton FC plays three games at The Shipyard as they host both Miami FC 2 and Jacksonville Armada on June 2 and 16 respectively and Fort Lauderdale Storm on June 30. The Boys in Blue will be on the road for three games in June starting on June 9 versus Miami United. The club will then head to face Palm Beach United on June 20, and Naples United on June 23. Boca Raton FC will close out the 2018 regular season on July 3 as they take on Palm Beach United at Atlantic High School. At the conclusion of the season, the top three seeds in the conference make the playoffs. The #1 seed gets an automatic berth in the conference finals, while the #2 and #3 seeds play in the conference semifinals. Central Broward Regional Park will host both the conference semifinals (Wednesday, July 11th) and finals (Saturday, July 14th). Both season ticket packages and single game tickets for Boca Raton FC’s 2018 NPSL campaign at Atlantic High School Stadium are available now by visiting www.bocaratonfc.com/tickets.